Suitable for any person selected by their employer wishing to act as a Paediatric First Aider in areas where children are present eg, Schools, Nurserys, Early Years Settings. Duration: Two days comprising of tweleve hours contact time with the Trainer. Assessment: Ongoing pratical assessment by the trainer. Level 3 Paediatric First Aid (QCF) Award meets the requirements of Ofsted *REPLACES Level 2 (QCF) Paediatric First Aid from September 2014*. There is no longer an authority approved list as of the 1st September 2014. 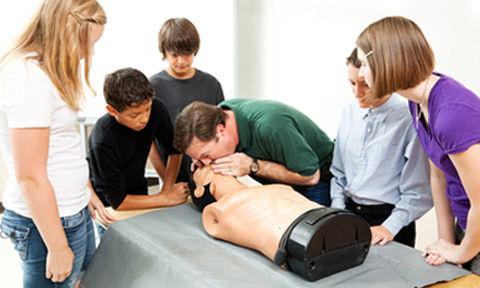 Aims of First Aid: Provides students with an understanding of the goals of first aid. Priorities of First Aid: Students will understand the Danger, Response, Airway, Breathing, and Circulation approach. The Priorities of first aid to Preserve,Prevent, and promote patient recovery and how this can be achieved. This section will also detail who is in charge of a first aid incident. First Aid Theory: The student will understand appropriate legislative updates and the Law. The Student will also be updated on any changes in First Aid that have occurred or are foreseen in the future. Unconscious Child/Infant: Students will understand the causes of unconsciousness, what has happened to an unconscious child/infant, and how to recognize the unconscious child/Infant. The Student will also learn the recovery position for infant/Child and the rationale of the recovery position. Resuscitation: Students will understand the rationale behind Cardio Polomanary resuscitation and common causes of cardiac arrest in infants/Children. Students will learn Basic Life Support for infant/Child resuscitation according to the UK Recucitation Council guidelines. As best practice students will also learn adult Basic Life Support however this will not form part of the assessment or award process. Head Injuries: Students will learn definition of a head injury. The three different types of head injury. Concussion, compression, and base of skull fracture, Their associated signs and symptoms and management, treatment, and positioning of a child/infant with head injuries. Burns and Scalds: Students will learn difference between a Burn and a Scald. The three different categories of severity of burns/scalds. Immediate treatment options and how to deal with chemical burns and burns to different areas of the body. Epilepsy: Students will learn the definition of epilepsy and the causes and triggers of epileptic seizures. The three categories of seizure absent seizure, major seizure, and status epilepticus. Bleeding: Students will learn how to identify six different types of external wounds. High impact wound, Incised, laceration, contusion, abrasion, and puncture and how they may occur. Students will also learn diffrent types of blood vessels in the body and how they bleed. Students will also understand blood loss and blood volumes. Shock: Students will learn different types of shock, cardiogenic shock, Neurogenic shock, Anaphylactic. Recognition and positioning of different types of shock. Choking: Students will learn common risky foodstuffs that may cause a infant/child to choke. location of high risk areas of choking. Recognition and treatment of a choking child/Infant. Eye Injuries: Students will learn a range of different types of eye injuries recognition, management and treatment options. Ear Problems: Students will learn a range of different types of Ear injuries recognition, management and treatment options. Diabetes: Students will be able to define diabetes, causes, diffrent ways existing diabetes is managed. Students will also learn diffrent types of diabetes recognition and treatment of a infant/Child suffering from hyperglycemia and hypoglycemia. Convulsions: Student will be able to define convulsions, causes and treatment of a infant/ child suffering from convulsions. Sickle cell anemia: Students will be able to define sickle cell anemia, causes and treatment of a sickle cell crisis. Meningitis: Students will be able to define different types of meningitis, signs and symptoms and immediate treatment options. Students will also learn how to report a suspected meningitis case to the authorities. Effects of heat and cold: Students will learn differences between hyperthermia and hypothermia. Temperature ranges and risk factors and treatment options. Fractures: Students will be able to define a fracture. Three categories of fractures. Open, Closed and complicated fractures. Recognition and stabilization of fractures, dislocations, and suspected spinal injuries.